Swedish audio manufacturer Jays is known for its minimalistic design philosophy, and today we have its recent budget offering called the a-Six for review. 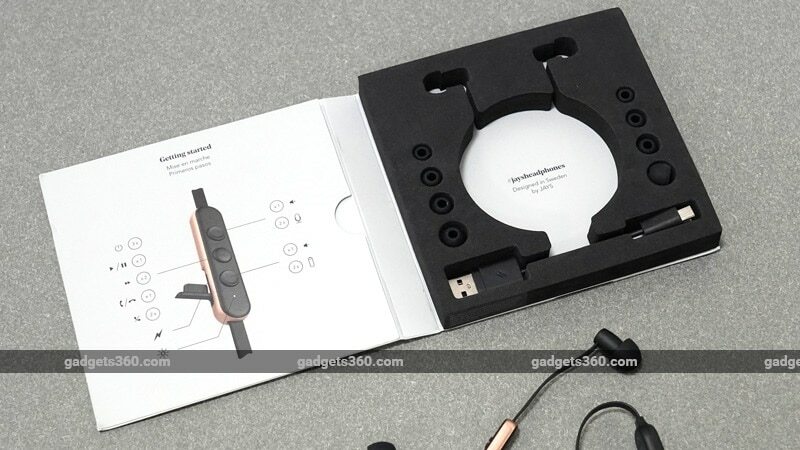 This pair of earphones is said to be one of the smallest in the world, but the a-Six still boasts of a 12-hour battery life and premium construction. The a-Six costs Rs. 5,999, which means that it competes against the likes of the RHA MA390 wireless earphones. Let’s see if it manages to deliver on its promise. Jays wasn't kidding about the a-Six being one of the smallest pairs of earphones in the world. The size of the chambers is tiny, due to which they hold 6mm drivers instead of the usual 9mm size. The housings are built using aluminium though a CNC process, and there are laser-cut holes at the back which acts as bass ports. The matte finish is something we quite like too. We have the ‘black on gold’ option but you can opt for ‘white on silver’ or ‘gray on silver’ if you prefer. 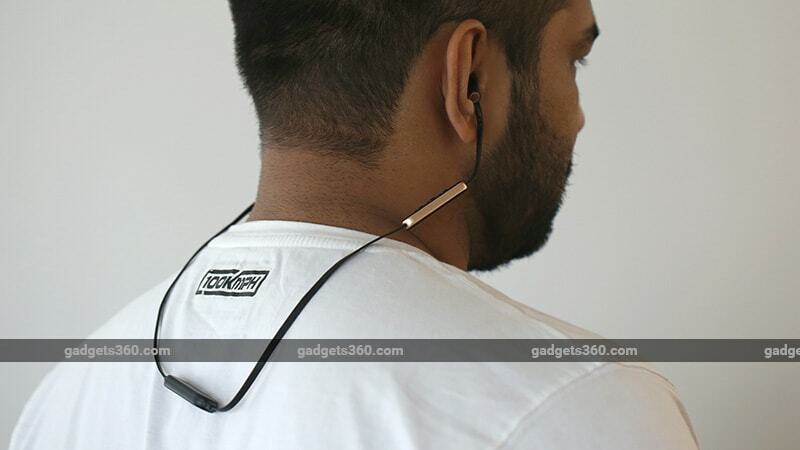 This pair of earphones has an around-the-neck design but doesn't actually rest on your neck like neckband earphones. The earpieces are incredibly light and the flat cable feels durable. The battery is placed in a little plastic module between the two earpieces, which is a bit of a problem. It doesn’t weigh much but its placement causes it to pull the earpieces backwards and out of your ears. The wire also has an in-line remote near the right earpieces, which houses three buttons for playback, a MEMS microphone, a Micro-USB charging port, and a LED light. The plastic used here feels quite average and the finish isn't very refined. There's also a rubber flap that covers the Micro-USB port. The packaging for the a-Six is pretty minimalistic. The device is secured in a foam mould, which also houses four extra sets of ear tips in different sizes, and a short Micro-USB cable. We would have liked a bundled pouch or case as it’s easy to misplace the a-Six given its small size. The a-Six uses Bluetooth 4.1 and has a frequency range of 20Hz-20,000Hz. It only supports the SBC streaming audio codec, which means there’s no support for the high-resolution AAC or aptX codecs. The earphones don’t have any sweat-resistance rating, which is a feature that’s commonly found in headphones in this price range. The a-Six is extremely comfortable to wear as you barely notice the earpieces in your ears. We had some trouble with the fit of the silicone tips as even the largest size wasn't quite snug enough. Just walking around would gradually interfere with the seal, so the a-Six is definitely not suited for outdoor activities such as running or training. Jays should have ideally shipped some wingtips them to secure them in place. Plus, as we stated before, the battery chamber tends to pull on the earpieces. The remote control works well and after a while it’s fairly easy to understand which button you’re pressing just by touch. Since the play/ pause button doubles up as the power button, the function for summoning your phone’s voice assistant has been shifted to the volume up button. Holding the volume down button lets you check the battery level, through a voice prompt. A double-tap of the play button lets you skip to the next track but oddly, there’s no shortcut for going to the previous track. When it comes to audio quality, the a-Six will surprise you with its warm and balanced tone in most music genres. Once you get a good seal with the ear tips, the earphones showcase a very good soundstage for the size of the drivers, and the separation of instruments is handled very well most of the time. We didn’t notice any distortion at the highest volume either, although we would have ideally liked a higher upper volume limit. There isn’t much sound leakage, and the microphone is decent for phone calls when on the move. In complex rock tracks such as Numb by Linkin Park, the drivers tended to struggle a bit with mid-range separation, but still managed to deliver crisp vocals. The bass was amply present and didn't feel overpowering at any point. In fact, the a-Six delivers controlled bass which is easy to tell with tracks such as Shone by Flo Rida. Highs are represented well and don't get shrill or piercing at high volumes. However, it's hard to enjoy any of this for long as the ear tips don’t stay put when you move about, which is a real shame. Jays claims that the a-Six can run for 12 hours at a stretch, but the reality was quite disappointing. With the volume at about 80 percent, we managed to average just four and a half to five hours of music playback. Sure, you can could get a little more at lower volume levels, but since the maximum volume isn’t really very high, you’ll have no choice but to crank it up very often. You'll hear a voice prompt when the battery is low. It takes about one and a half hours to fully charge the earphones when connected to a laptop. The Jays a-Six has a wonderfully inconspicuous design and delivers warm, balanced sound with good helpings of bass. However, the around-the-neck designed seems fundamentally flawed as the battery bump sits smack in the middle of the wire and pulls on the earpieces, loosening the seal of the ear tips. This wouldn’t be a big issue if the ear tips had a more secure fit, but even largest size wasn't adequate in our experience. Then there’s the price. At Rs. 5,999, the a-Six is missing features such as sweat resistance and high-resolution Bluetooth streaming codecs. We also found the battery life to be quite average, and well below what the company claims. The RHA MA390 Wireless offers much better features at the same price. Alternatively, if you want to save some money, there’s always the OnePlus Bullets Wireless, or the Sony WI-C300 if you’re not a fan of neckband-style earphones. 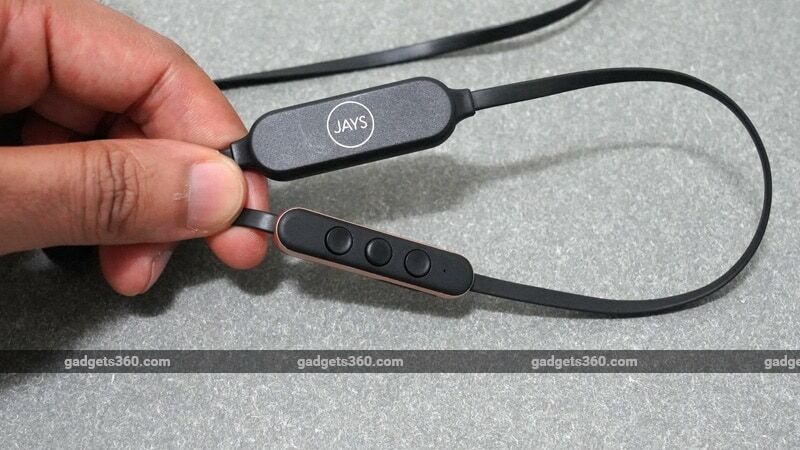 product The Jays a-Six wireless features one of the smallest earpiece designs in the world. But does it deliver good audio? Read our review to find out.